To keep my wheels turning, I ask the good citizens of tumblr to use the “ask box” feature to give me questions. 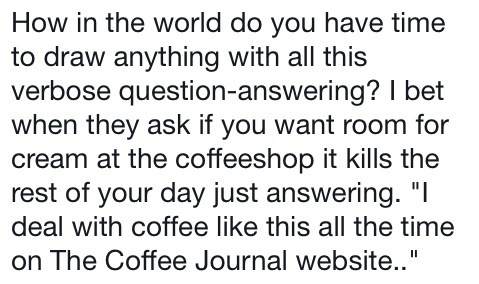 These questions are generally fantastic. For reference, I live and work in New York City. I do most of my writing on my smartphone. That’s the life that I lead. I write lots of the material for Comix Cube and for my tumblr blog while riding the train or while walking down the street. I have excellent peripheral vision. If I can convince artists of nothing else, I hope to show people: draw in the morning. You will fail at night. You will not succeed at making things in the night. Here’s why. When you wake up in the morning after an appropriate amount of sleep, your body is refreshed, recharged, renewed. Your ideas are fresher, your troubles are calmed, you are simply healthier in body and mind. But that’s not the main advantage! During the course of a day, any given day, your life’s activities and pressures and stressors will gather and accumulate. When you go to work or go to class or go to meet your friends or just sit in your room, things happen which add to your responsibilities, obligations and stresses. Example: you want to draw at night. You go to class at school and have a difficult time with a quiz. You know you’ve bombed it and you just feel down all day. Example: you want to draw at night. But it’s game night and you want to hang out with your friends! And you should. Example: you want to draw at night. Before you can get settled in, your manager calls in a panic because the closing shift person quit unexpectedly. Example: you want to draw at night. Nothing bad has happened to you all day but you are just exhausted! You have school and/or a job and/or friends and/or that news report has absorbed your attention and/or your significant other ❤ and/or you've been on your feet all day and/or you're Just Tired and/or you need to buy groceries and/or it's your turn to make dinner and/or your out-of-touch friend called you out of the blue and you're reminiscing and/or You Just Don't Want To! Give up on the night. You know what I'm doing tonight? Probably not drawing! I think I'll have dinner with a friend or go on a coffee date or try to catch up on television or read one of the graphic novels on my stack of books or read one of the prose books that I've been avoiding. I don't feel any urgency to draw tonight. I did my day's drawing before 8:05am. I'm off-duty. "I'm not a morning person!" So what? Make yourself into a morning person. Retrain your mind. Retrain your body. You're a human being, you're adaptable. Set your alarm earlier and go to bed at a reasonable hour. Leave the night life to the people who don't have stuff to do. You want to draw a picture per week? It ain't a prob at all, my friend! Here's your schedule. Change the details based on what your details are. I work a 9-to-5 job. Forty hours per week, Monday through Friday. Monday morning: sketch. Doodle. Just scribble in your sketchbook or copy pictures from magazines. Tuesday morning: looking over your sketches from Monday, you have some ideas forming. Do some thumbnail layouts and practice the picture composition. Thursday morning: pick up where you left off and keep drawing your final document. Friday morning: you're almost there! Saturday (whatever is closest to a day off for you) : FINISH IT!!!! Get it? Got it? Good!! I was born in 1981. 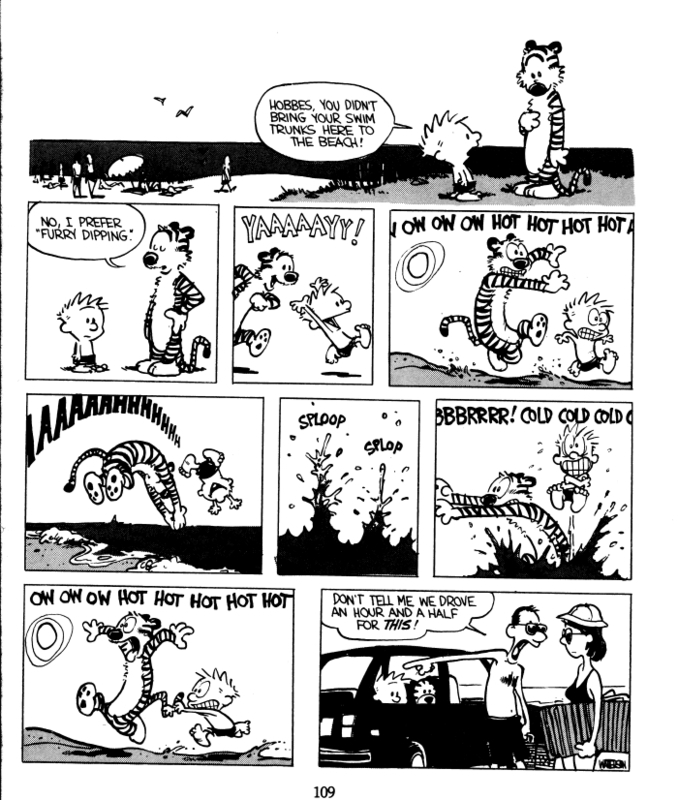 So for many people my age, I was just about Calvin’s age when Bill Watterson started Calvin and Hobbes in 1986. And like many people my age, I fought back nostalgic sniffles on December 31, 1995 when Calvin and Hobbes took their final sled ride. I haven’t seen the above strip in years, friends. Today (Thursday, December 1st 2011), I finally discovered which volume of the black-and-white collections that this particular strip was compiled in and I promptly purchased that book. Whenever possible, I think we all owe it to ourselves to look our origins right in the face. Everything I’ve worked for, everything I’ve been striving to do all my life stems from this strip–and moreover, stems from the direct memory of my mother showing me something that she thought was really cool. A lot of people don’t really understand my need to talk about and discuss comics. Since comics are printed literature, many would prefer to read and absorb the work privately. For me, the discovery of comics was very tied in with the idea of a shared experience and even performance (since my mother loves to read things dramatically). Comics, at their best, are an integrated part of a wider cultural experience; no different from films or novels or music. For me, comics have always been a something one shares–as well as part of a larger tapestry of daily experiences. Now…how about them Yankees? You read the same blogs day in and day out. You follow the same webcomics for months and years on end. You need an injection of fresh inspiration; a change in diet. Here’s a sizable meal of Tumblr blogs that might get your brain open. Comics can never die, so they can’t be in need of saving. This article is specifically about the North American comic book paradigm, particularly as created for, and distributed by, the Direct Market. Before you read further, I have no qualifications. I am just a person with a laptop.